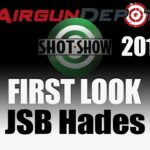 SHOT show 2019, I’m at the Predator booth giving you the first look at the new Hades frangible pellets. Now this is a lead pellet, but if you look at it, it’s a sort of hollow-point. The top looks like like a biohazard sign, as my friend Joe of Predator says. Now, this is a pellet that’s designed for the hunter. It goes in, it doesn’t penetrate very far, but it breaks apart giving you a lot of damage, making a quick clean kill on the animals. Now they’re available right now in .22 caliber, we will get a .177, .25 later on this year. The .22 should be out you know middle of March at the latest. You know we’ll give you a pricing, but they’re not going to be too different from any other Predator pellets, so a really good value and exciting pellet coming out from Predator. For more SHOT show coverage, stay tuned.